Bac Hoang’s artistic talent and over 30 years experience in the Faux Finishing Industry has attracted a discriminating clientele, including famous sports figures and actors of international acclaim. His clients expect and indeed demand a high standard of performance and results. Following are magazine, book and newspaper articles that demonstrate the caliber and scale of projects on which Bac has worked. For more examples and details of his craft, view his Portfolio or contact Bac to schedule a free consultation to discuss your unique situation, needs. Helped landscape designer solve a problem with cracks and damage of exterior pots and planters before the photo shoot. Bac worked on this project with the General Contractor, touching up damage from traffic. 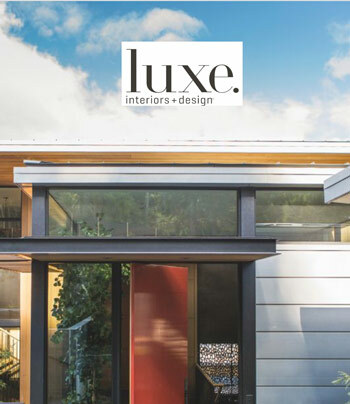 Textured materials, custom furnishings and compelling artwork come together within a Tiburon home that’s both grounded and expansive. 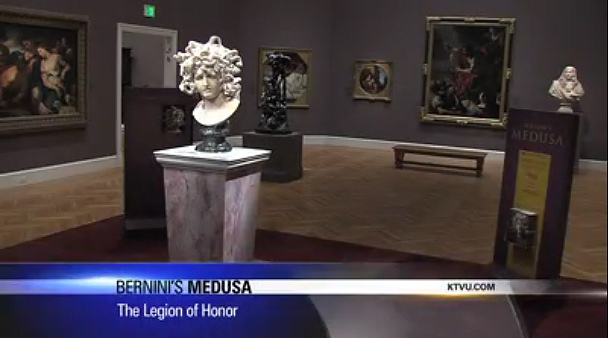 First time in the US: Bernini’s Medusa sculpture comes to SF. On view at the Legion of Honor until Feb. 19th, 2012 is the remarkable Baroque masterpiece The Medusa by Gian Lorenzo Bernini. Part of the rarely traveled “Dream of Rome” project. A New angle: Medusa’s early career as punished by by Minerva for making love with Neptune in her temple and her hair turns into hissing snakes. Instead of the angry expression we know from other artists, in this we see her anguish over the transformation. This remarkable marble sculpture is carved out of one block of marble chosen for its particular bronze-tinted color that creates close rendition of human flesh. Bac worked on the Pedestal on which the sculpture is displayed. Being contracted by the De Young to produce this finish was a great honour. It’s exactly the kind of project most Faux Finishers dream about and to be part of it’s creation was wonderful. Mr Bill White of The De Young worked with us as we developed a series of samples for the project. The Venetian Rose and Blanco were ultimately chosen. Bac began the painstaking process of preparation, creating a surface so smooth that only a hand’s touch could detect a difference. We layered texture and drift, sinking all under many coats of varnish. The Venetian Rose was the more complex of the two and the palette Peta finally used was a diverse and rich one. The Blanco, even though seemingly Black, grey and white, surprised both of us in it’s range of hue and Bac’s rendering of it is luxurious and true. Click for KTVU TV station news article and video about the exhibition. 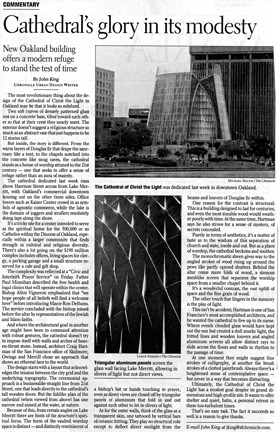 The most revolutionary thing about the Cathedral of Christ the Light in Oakland may be that it looks so subdued. Two soft curves of densely patterned glass rest on a concrete base, tilted toward each other so that at their crest they nearly meet. The interior doesn’t suggest a religious structure so much as an abstract vase that just happens to be 12 stories tall. 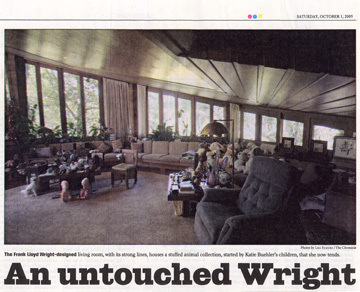 — 2008 SF Chronicle Newspaper Article. Bac was among several talented Bay Area artists contracted with to provide finishing touches to the cathedral’s interior, participating in the creation of the art and textures on the ceilings of the Meditation Chapel Sanctuaries on each side of the main gallery. He also painted some of the ceiling of the exterior entry hall of this amazing cathedral. The results are an excellent example of color and texture matching skills. 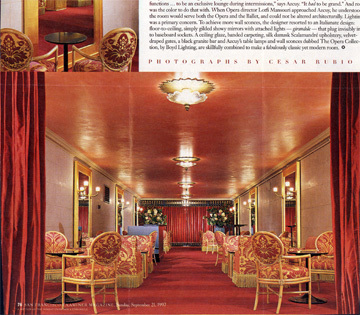 His faux magic included matching the polished plaster walls beneath in these meditation sanctuaries. photography by Diane Dorrins Sacks. 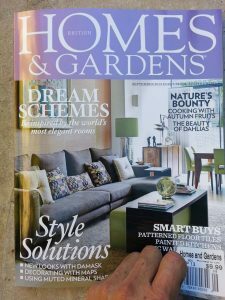 See some of Bac’s work featured in the “Sonoma County Country Retreat” (page 69), “A Dash of Color in Atherton” (page 110) and “In the California Wine Country” (page 139) articles. 22 Carat, Gilded mirror frames. a Vermillion ceiling above and beautifully marbleized pedestals below, all working in harmony to create the perfect backdrop for donor conversation. A Gilded ceiling by Bac expresses the perfect lines of of this gracious space. 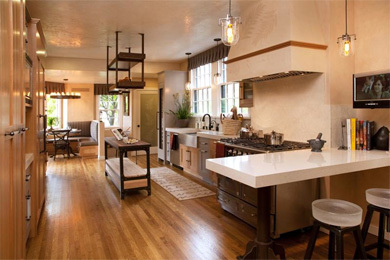 Presidio Heights kitchen with colour impregnated, Venetian plaster walls and ceiling. An inlayed fern motif emphasizes the rustic beauty of the stove hood. Help the General Contractor solve imperfections with the concrete floor. 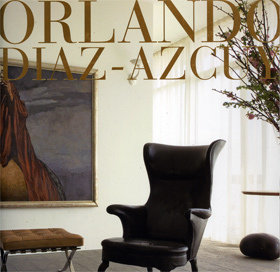 Contact the artist to view his portfolio book of photos and clippings from various publications or view examples online. 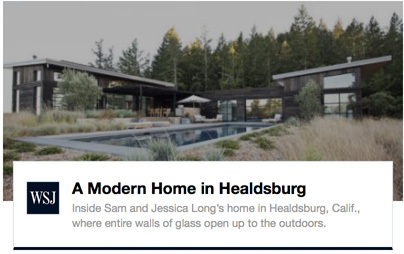 The portfolio includes samples of work on the high-end properties of famous athletes and internationally recognized celebrities and prominent people in exclusive San Francisco, Marin, Sonoma, Napa and other Bay Area neighborhoods.